The concept of using an acid on skin sounds scary. Acids can’t be good for skin, right? As it turns out, there are many acids that are wonderful for skin. In fact, adding acids to your skincare routine transforms your skin in ways that will truly impress, no matter your skin type, age, or concerns. We’ve rounded up the acids that mounds of research have shown are great for skin. We explain what they are, how they work, and who they’re best for so you’ll know which acids are right for you! Alpha hydroxy acids are a group of ingredients that include glycolic, lactic, malic, tartaric, mandelic, and citric acids. All of them can be effective for exfoliating skin, but among them, glycolic and lactic acids are considered the most effective; citric acid is generally not included in the amounts needed to exfoliate because it’s too acidic (think lemon juice). When properly formulated—meaning within the correct pH range for the acids to be effective—AHAs work to unglue the “cement” that holds dead, dull skin to the surface, keeping it from shedding naturally so it builds up. Left unchecked, this buildup leads to dull, rough skin that loses its youthful smoothness, even tone, and glow. All skin types can benefit from AHAs, but they’re best for normal to dry skin showing visible signs of sun damage. Regular use of AHAs reveals smoother, softer, visibly firmer, and more even-toned skin with fewer signs of sun damage, including fine lines and wrinkles. You’ll find glycolic acid in several Paula’s Choice Skincare products, including SKIN PERFECTING 8% AHA Lotion and RESIST Daily Smoothing Treatment 5% AHA. There’s only one beta hydroxy acid, and that’s salicylic acid. It’s a multi-tasking ingredient that has been used in skincare for decades because it’s amazingly effective. When properly formulated—meaning within the correct pH range for exfoliation—BHA works similarly to AHAs to exfoliate skin’s surface and hydrate. However, because BHA is oil-soluble (AHAs are not), it penetrates into the pore lining, where it works to dissolve clogs that lead to bumps and blemishes on skin’s surface. BHA also has a natural ability to calm skin, so it’s preferred for those struggling with sensitive skin. Its gentleness makes it suitable even for rosacea- or milia-prone skin. All skin types can benefit from BHA, but it’s best for normal to oily or combination skin that has blemishes, bumps, clogged pores, overly sensitive skin, or post-acne marks. Daily use of salicylic acid will refine pore size, alleviate bumps and clogs, soften the look of wrinkles, improve skin texture, tone, and hydration, and restore a gorgeous glow. See what we mean by “multi-tasking?" 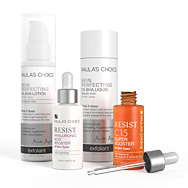 You’ll find salicylic acid in several Paula’s Choice Skincare products, including our best-selling SKIN PERFECTING 2% BHA Liquid and RESIST Advanced Pore-Refining Treatment 4% BHA. Hyaluronic acid is a glycosaminoglycan, a fancy name for a vital natural substance that’s a youth-supporting part of skin. With age and cumulative sun damage, our skin’s natural supply of hyaluronic acid decreases. Hyaluronic acid has restorative abilities and can boost skin’s moisture content, soothe skin, and defend against moisture loss. It is capable of holding up to 1,000 times its own weight in water, making it an optimal hydrator for all skin types. Want more? It’s also a skin-calming antioxidant! All skin types can benefit from hyaluronic acid, as well as from its salt form, sodium hyaluronate. You’ll see smoother, perfectly hydrated skin plus a plumped appearance to address the look of bothersome fine lines and wrinkles, including around the eyes. You’ll find hyaluronic acid in many Paula’s Choice Skincare products, including Hyaluronic Acid Booster and RESIST Ultra-Light Super Antioxidant Concentrate Serum. Ascorbic acid is another name for pure vitamin C, an ingredient that occurs naturally in our skin and in many foods. Ascorbic acid is a superstar for its proven antioxidant properties that help defend skin from environmental assault by thwarting the elements—including from pollution—that progressively weaken skin’s surface, chipping away at a youthful appearance. All skin types can benefit from ascorbic acid and its non-acidic derivatives, such as ascorbyl glucoside, tetrahexyldecyl ascorbate, and several others. Your skin will take on a smoother, firmer look as signs of wrinkles, uneven skin tone, and dullness seem to fade. Ongoing use keeps skin looking bright, healthy, and resilient. You’ll find ascorbic acid in our C15 Super Booster and C25 Super Booster. Simply put, amino acids are the building blocks of protein. Our skin’s surface is composed primarily of proteins, and proteins wouldn’t exist to create skin without amino acids. In skincare products, amino acids act as water-binding agents; some also have antioxidant and calming properties. Because they occur naturally in skin, they’re easily recognized and put to good use with other beneficial ingredients. Amino acids are great for all skin types. Due to their water-binding capacity, you’ll see and feel smoother, more supple, and hydrated skin from amino acids like proline, leucine, arginine, and serine. You’ll find amino acids in many Paula’s Choice Skincare products, including EARTH SOURCED Purely Natural Refreshing Toner. Retinoic acid is what the gold standard anti-aging ingredient retinol is converted to when applied to skin. This is the form of vitamin A that has a natural affinity for skin. Once retinol is converted to retinoic acid, it works in numerous ways by “talking” to elements within skin’s surface that are misbehaving. After this “talk,” skin steadily shows signs of improvement. Retinoic acid is ideal for those struggling with multiple signs of aging, blemishes, and other signs of skin behaving badly. Think of it as the personal trainer that gently gets skin back to looking and feeling its best. Over 40 years of established research shows that retinoic acid helps visibly increase the appearance of firmness, diminish the look of fine lines and wrinkles, significantly improve uneven skin tone, smooth and refine the surface of skin (yes, that includes pores), and bring the look of skin to a healthier state. You’ll find retinol in several Paula’s Choice Skincare products, including RESIST Barrier Repair Moisturizer and CLINICAL 1% Retinol Treatment. Fatty acids are naturally occurring ingredients that are a vital part of a smooth, healthy, and vibrant skin barrier. Examples include oleic, palmitic, linoleic, and linolenic acids. Skin easily recognizes fatty acids, putting them to work right away to replenish and reinforce its barrier (surface), strengthening it against moisture loss and signs of environmental damage. Many fatty acids also soothe skin, allowing it to become visibly calmer and less reactive. Fatty acids are essential nutrients for skin; as such, they’re brilliant ingredients for all skin types, especially dry to very dry and sensitive skin. You’ll see a noticeable increase in skin’s hydration, softness, and ability to bounce back from environmental stressors that would normally send skin into a tailspin of trouble. You’ll find fatty acids in many Paula’s Choice Skincare products, such as our RESIST Omega + Complex serum and RESIST Advanced Replenishing Toner. The acids described above are some of the most beneficial for skin, but there are other acids that are also worth seeking out. Examples are antioxidant acids such as alpha lipoic acid, ferulic acid, and ellagic acid; brightening ingredients like kojic acid and 10% Azelaic Acid Booster; and soothing glycyrrhetinic acid from licorice. They’re suitable for all skin types and found in select moisturizers, serums, and toners.